Russia's foreign minister is holding talks with Georgian President Eduard Shevardnadze to try to resolve Georgia's spiralling political crisis. Igor Ivanov met Mr Shevardnadze in Tbilisi hours after opposition supporters stormed parliament. Mr Shevardnadze has declared a state of emergency and threatened to use the army to enforce it. But the Georgian defence minister has said the army will not use force to try to restore political order. "The state of emergency doesn't envisage the use of military force to establish order," Defence Minister David Tevzadze told reporters. He was speaking hours after opposition supporters, enraged by suspected fraudulent election results, stormed the Georgian parliament on Saturday, triggering political upheaval. Opposition officials said some members of the National Guard and the interior ministry's special forces were now supporting them instead of Mr Shevardnadze. But the BBC's Chloe Arnold in Tbilisi says the picture is confused and it is not at all clear which side the army is supporting. President Shevardnadze said the army would take over if the newly-elected parliament was not allowed to meet to ratify the emergency decree within 48 hours, as required by the Georgian constitution. Armed personnel carriers have been spotted on Tbilisi's streets, but security forces allowed demonstrators into parliament - some even offering words of encouragement, our correspondent says. She says thousands of protesters are still standing outside parliament waving flags amid a real sense of celebration. After Mr Shevardnadze was forced out of his offices, the outgoing opposition parliament speaker Nino Burjanadze said she was temporarily assuming the presidency. Our correspondent says there is a bizarre situation in Georgia where there are now effectively two presidents and no parliament. The US and the UN have urged President Shevardnadze to exercise restraint in resolving what he has called a "coup" and the opposition describe as a "bloodless revolution". Mr Ivanov met opposition leaders before going in for talks with Mr Shevardnadze at his Tbilisi residence. 20 Nov: Central Election Commission declares Shevardnadze's party election victor; US claims "massive vote fraud"
Following their meeting, the leader of the opposition National Movement, Mikhail Saakashvili, said he had told Mr Ivanov he was calling for a peaceful change of government and president in Georgia. Mr Saakashvili told the BBC that he had secured a promise that Moscow would not use its own military forces in the conflict. There was surprise and wild applause when Mr Ivanov appeared as opposition supporters were celebrating at the parliament building just after 0300 on Sunday (2400 GMT). He told them he was there to help find a way out of the crisis. US Secretary of State Colin Powell and UN Secretary General Kofi Annan have made a joint telephone call to the embattled Georgian leader. "They encouraged him to deal with the current crisis with restraint and within the framework of the Georgian constitution," a State Department spokesman said. Governments around the world have urged both sides not to allow the situation to become violent. Former Soviet republics have condemned the opposition move. Saturday's dramatic developments began when thousands of people led by Mr Saakashvili stormed the parliament building. Mr Shevardnadze had been addressing the first session of the newly-elected parliament after the victory of his party and its allies in the 2 November elections, which were declared fraudulent by international observers. The president was bundled away by armed bodyguards as protesters entered the building. 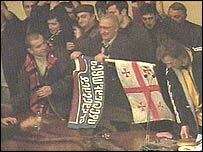 Opposition supporters then drove Mr Shevardnadze's supporters from parliament under a hail of books and pens after some fist-fights. Live television pictures showed scenes reminiscent of the revolutions that toppled the communist governments of Eastern Europe more than a decade ago. 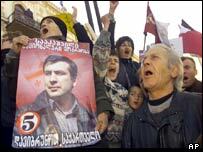 Mr Saakashvili and other opposition leaders declared they had carried out a bloodless - or "velvet" - revolution. "Georgia is in the middle of a popular revolution"